Add this adult deluxe Glinda crown to your Glinda the Good Witch costume for a complete look. The detailed crown has features like it's iridescent pink color with painted silver stars. Pink colored jewels and strands of sequins and beads decorate the top of the crown while the bottom is lined with tiny white pearls. A necessary addition to any Glinda costume! 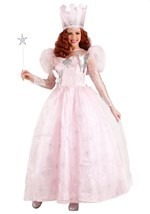 Add a pair of Glinda shoes and a red Glinda wig for a movie quality costume look!